Great location and affordable (for New York prices). Clean rooms and well kept from what I experienced. 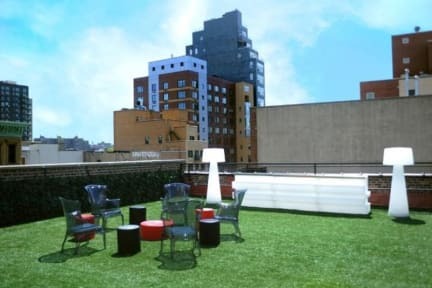 Easy place to find and navigate in, with a nice rooftop patio. Terrible cabin design in terms of open roof concept for the rooms. Provide small foam earplugs (which is very nice of them) but does very little to help not hear every bag zip or snore from the entire floor. They kindly dim the lights low, but with the open roof, if anyone around has their room light on, it is considerably bright. Very dark, dingy,noisy. The window would not open. it was very warm with no obvious air con. just an open too which meant no privacy. i was told off by someone shouting go outside and talk .the time was 8.30,om. if i had gone outside I would not have been able to use what's app to call. there were no privacy areas, you get to wait to have a shower. it felt like a camp site indoors and they should put mirrors in bedrooms. there was very little space and I was supposed to have an upgraded room! If you want to get a normal (I don't say even good) sleep this is definitely NOT the place you're looking for. A standard hostel is much better because you'd at least share your room with others, so you can warn them if they make noise. In this case, you don't see other people in your mini cubicle. (THE BED'S TOO SHORT for someone 1.75m.) Yet, you hear all the noise and morning alarms of everyone. That being said, the staff were friendly, the location is great, it was safe. This is not really a 'hotel', it's tiny, tiny cabins with an open roof so it's basically like being in a room with 20 or so others. You can hear everything, and so for that reason you are not allowed to take phone calls or even set alarms. There's also no lift, which is not ideal for having to carry your luggage up the stairs, but you also can't leave it by the door because anyone could just open that front door during the day. You also leave your keys with them to avoid a fee. Not the best. 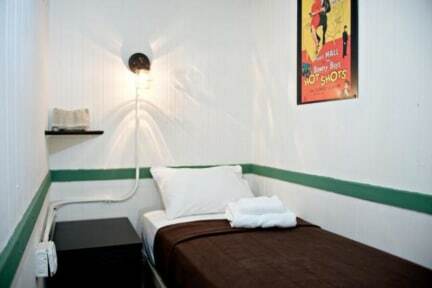 First, the hostel rooms are very little and very noisy (no roofs on rooms), and this is not very clear on their pictures. There is only one toilet (!!!) and 2 showers for about 40 rooms (one shower did not work though), and the place was dirty (toilets and showers). I stayed 9 nights and my room had not been cleaned once (nor my sheets changed). To finish the Wifi din not work 90% of the time. I clearly NOT recomand this hostel. Frustrating room, dirty shared bathroom and tollet. The air qualiry has made me ill. No kitchen, no lift. No sound proof so it was terribly noisy. The worst experiance i ever had in hotel. The room wasn't suitable to the number of the people, because of mistake of the hotel, so thay threw us to the street in the middle of the night.